Located in Sea Pines, 38 Canvasback is a magnificent 7-Bedroom Oceanfront home that sleeps 18 guests! Designed by an award-winning local architect, the highlights of this gorgeous home include the kitchen, dining area and multiple living rooms that maximize views of the ocean, an upstairs veranda with spectacular ocean views in both directions, spacious bedrooms with private baths and the private pool, spa and beach path that leads to Hilton Head's finest stretch of beach along the Atlantic Ocean. 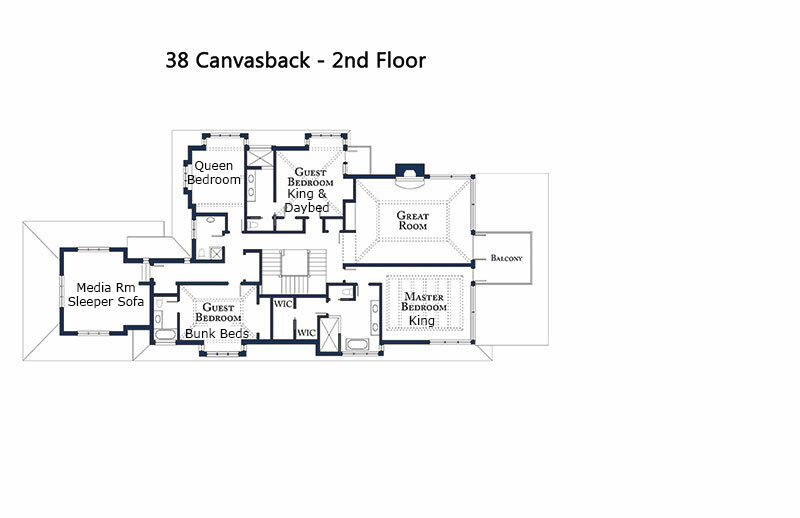 The main level of 38 Canvasback features a Master Bedroom with King bed, ocean view and private door to the patio and pool area, and a Guest Bedroom with a King bed and single sleeper in the window bay. The main level also features an open kitchen with state of the art appliances and center island that accommodates 6 bar stools. Views of the pool and ocean are enjoyed from the kitchen, as well as the adjacent Dining Area with dining table that extends to seat 14-16 guests, and Great Room with gas fireplace, 55" HDTV and beamed ceilings. The kitchen and Great room are surrounded by windows with views of the Atlantic Ocean, and French doors provide access from this area to the stunning patio and pool area. A separate back kitchen and laundry room are also located on this level with a full bath and side entrance. This area is perfect for rinsing off sandy feet after a day at the beach! The upstairs level features a second living room with gas fireplace, kitchenette with microwave, refrigerator and dishwasher, and access to the veranda overlooking the pool and ocean. Views from this level are spectacular! The Master Bedroom is next to the living room and also provides access to the veranda and shares the same magnificent views from this level. The other bedrooms on this level include: Guest Bedroom with King bed, daybed and private balcony with ocean views, Guest Bedroom with Queen bed, Guest Bedroom with two sets of bunk beds (Twin over Twin mattresses) and a 7th Bedroom/Media Room above the garage with a queen sleeper sofa, chairs and a 50" HDTV. All of the bedrooms have private baths, and the media room will share the bath with the bunk bedroom. An additional laundry room completes this level with full size washer and dryer, counter for folding, shelves and drawers for laundry baskets. Furnishings on the covered porch overlooking the pool and spa include a sofa, 2 chairs and a coffee table, as well as a patio table that seats 6 guests. An additional patio table with 10 chairs will be located on the limestone pool deck, in addition to pool furniture. The private pool is 16' x 36' and the spa seats 8 people. There is also an outdoor built-in gas grill and a private beach path with foot shower. Our family of 14 ( 8 adults and 6 children) thoroughly enjoyed our stay at 38 Canvasback. The house is beautiful ( just as shown in the pictures), the pool and spa is very nice and the beach right in front was perfect. We rented beach chairs and a canopy, bicycles and baby equipment from local rental companies. All were delivered and picked up as promised. Our group enjoyed riding bikes on the beach and through Sea Pines, a fishing trip and a wonderful dinner cruise from Harbourtown. This was our first visit to Hilton Head and everyone agreed- possibly one of our best vacations. Gail at Destination Vacation was so helpful with information before our arrival. Thanks for a wonderful vacation! We love "The Pink House," or even more fondly called, the "Lily Pulitzer" House! Beautiful accommodations and an extremely warm and inviting house! Thank you for your well-appointed and very comfortable hospitality!! This is our 6th trip to Sea Pines and our best yet! We loved the pool and our new, very fun game of "Diesel" played in your fabulous pool. And we had even more fun and relaxing memories down on your private beach access! We especially loved how perfectly manicured the yard and pool area are. Your attention to detail did not go unnoticed! We've also grown fond of our new turtle pets and pelican visits throughout the day. Thank you for allowing us to share a little piece of Heaven! We hope to be back! Our family of 14 had a fabulous week in your home. Everyone enjoyed the beach and your beautiful pool everyday. Sea Pines is a lovely area for a family vacation. The beachfront view is one of the best that we have enjoyed. Thank you so much for sharing your home with us. Our second year in your beautiful home. Your home is beautifully decorated and your have everything I needed to cook for 18+. The pool and landscaping are perfect. We always see little furry bunnies that are sweet. I hope we stay again next year for Heritage! The house was beautiful and perfect for my family. We had a fabulous week. Jennifer worked with us prior to our arrival on selecting this home. She alerted us when the house was ready for check-in which was earlier than 4 PM, which allowed us to get the groceries before the rest of our party showed up. She even contacted the owners to see if we could stay just one more night. Jennifer went way beyond the norm for us. 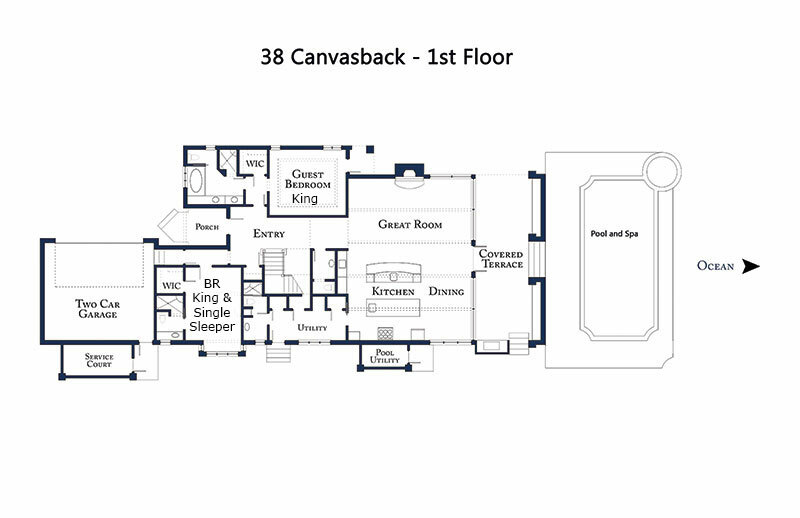 The home at 38 Canvasback was beautiful with very high end amenities. The home was immaculately clean. No other vacation home that we rented was as clean or as well maintained as this home. We had a few minor issues, such as we couldn't find the remote controls for the TV and the spa. Someone was there in less than an hour to help with the issues and were resolved. Very impressive! We liked the Sea Pines location but still somewhat close to Coligny. The setting was beautiful,the pine and palm trees with hibiscus surrounding the pool and framing the oceanfront view was enchanting. The spa was enjoyed by all in the chilly fall evenings. And yes the spa temperature was perfect with steam mixing with the cool evening air, very inviting. We have frequently encounter hot tub issues on vacation, either the spa is inoperable or just not warm enough. This was a perfect vacation and Jennifer and Destination Vacations really made it happen. I would definitely recommend Destination Vacations for your Hilton Head trip. What a fabulous home! The best house ever on Hilton Head Island. We loved all the amenities and had perfect weather for the evening hot tub use. Your home is so well maintained. It was so nice to watch the sunrises and sunsets from your beautiful porch. The oceanfront setting with the landscaping and pine trees was so enchanting. Hope to return to 38 Canvasback. Your house is beautiful! The best view we've had in our several years of coming to HHI. Our group of friends (6 adults, 7 kids) is so thankful for the laughs we had and the memories we made in your lovely home! Thank you for sharing! "Fabulous Home! Stunning Views! Very Clean! Beyond Equipped!" 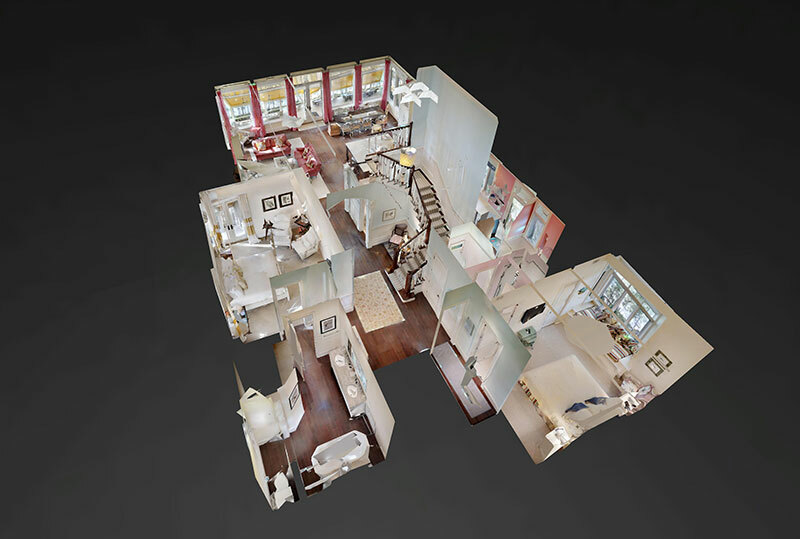 We highly recommend this Amazing home! So well planned to handle our entire family of kids and grandkids (18). Two ovens, Two sets of washers & dryers, two living rooms, Two master bedrooms plus other lovely decorated bedrooms. Huge kitchen that is fully equipped with everything. Beautiful Large pool and heated hot tub. The lawn was meticulously cared for. Each room was tastefully decorated. And the ocean views from most every room in the house is Stunning!!!! A Real Gem of a place! Would love to come back again! This is the best appointed home we have ever rented. We loved the additional washer and dryer and dishwashers! We also felt there were ample dishes, appliances, etc. in the kitchen. The view is fabulous! It's like sitting in a Southern Living magazine. It is well equipped and has a wonderful layout. We built up the beach access so it is no longer a swamp access. Thank you for sharing your beautiful home with us! We have enjoyed our stay. The upstairs living space is wonderful. We were celebrating our 50th Wedding Anniversary. Fabulous Week. All the family were able to come except oldest grandson who was deployed to Quwait in June, sadly. Your home is beautiful and we had a wonderful extended family vacation. The kitchen was perfect for great family meals and the access to the beach made it so easy for everyone to enjoy. The view is incredible from every floor. Thank you for a wonderful week. With 5 bedrooms and baths plus a bunk-bed bedroom and a media/bedroom, there is plenty of room for a large crowd. But the best part of the house is the porch with it's view of the ocean, the outdoor tables and chairs for dining, the beautiful pool with spa, and the short walk to the beach! Can't beat it! !